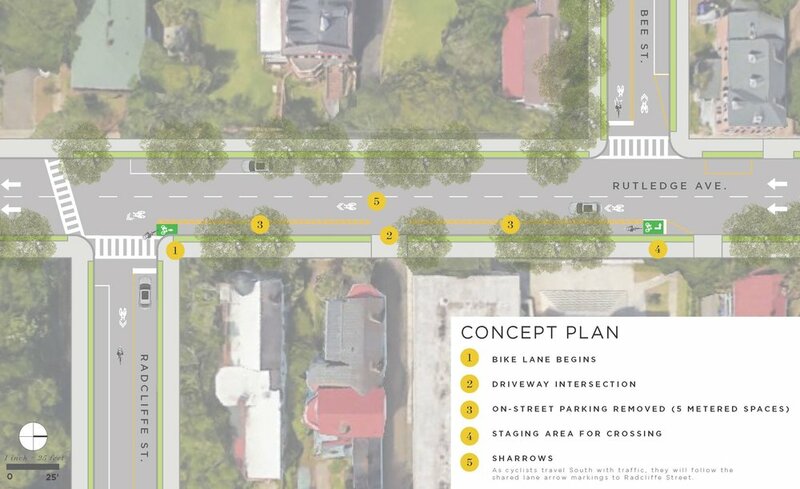 Design Division creates conceptual streetscape design plans for the urban bikeway configurations recommended in the People Pedal Plan. These "Project Sheets" are guided by the People Pedal Plan route maps, stakeholder and community input, and the unique opportunities and constraints of the site at the time of design. We also guide and monitor the development of streetscape plans by others. This includes being involved in regional roadway design projects, guiding the actions of local development projects though the Technical Review Committee and informal partnerships, facilitating "tactical urbanism" (short-term demonstration) projects on City-owned streets, guiding the implementation of roadway markings, and seizing upon any other design opportunity that will implement the People Pedal Plan. 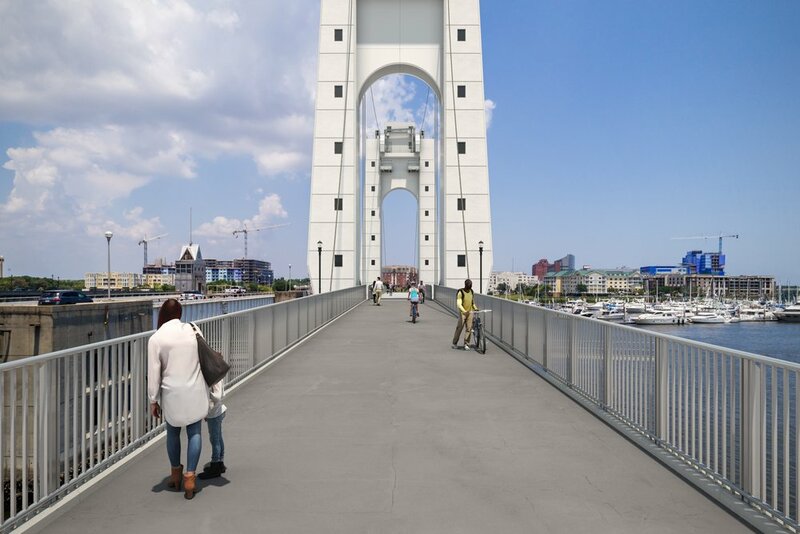 The City of Charleston has resubmitted a federal grant application for a bike-pedestrian bridge across the Ashley River. We provided the conceptual guidance and various types of support for this complex grant application. 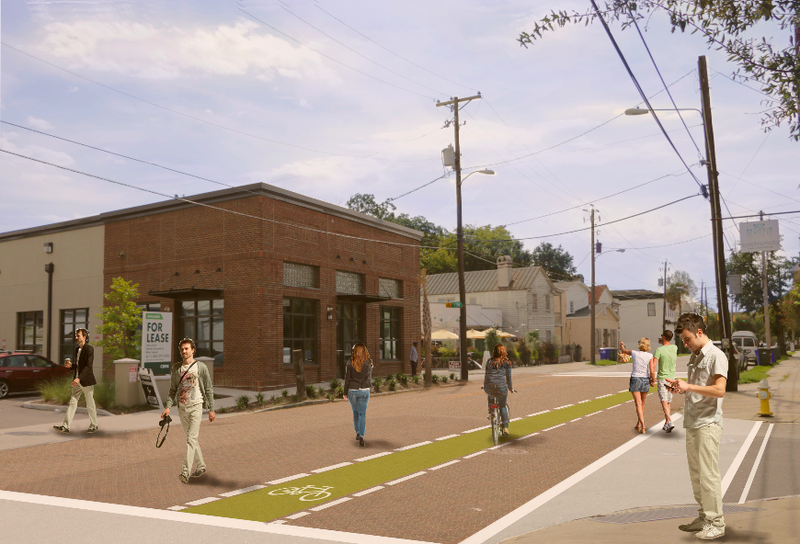 If awarded, this critical link will connect the peninsula to the West Ashley Greenway. Columbus Street to Huger Street, with addition of Huger Street to Romney Street in the near future. This federal highway functions as a local main street, but more work is needed for bicycle connectivity. We'll be looking at this in the Fall of 2018. Short segment of contra-flow protected bikeway on Rutledge Avenue to connect two streets with newly-installed sharrows: Bee Street with Radcliffe Street. Calhoun Street to Line Street. 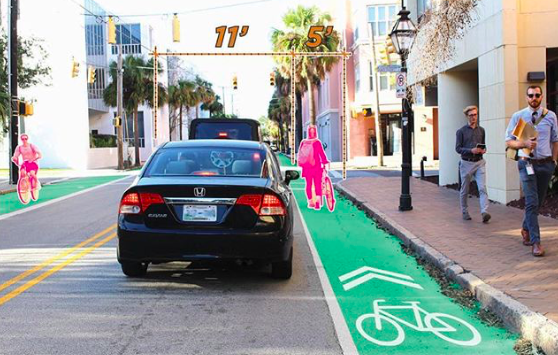 We are examining opportunities for bicycle infrastructure in short- and long-term, especially in accordance with the eventual conversion of Coming Street to two-way travel.